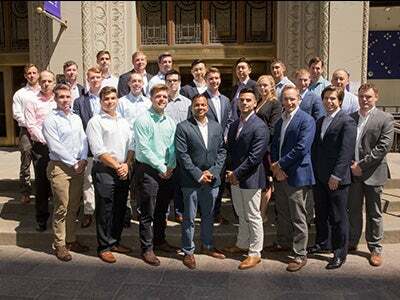 This summer, NYU Stern welcomed the inaugural group of students who participated in the School’s Fertitta Veterans Program. Believed to be the only program of its kind at a U.S. business school, the Fertitta Veterans Program is exclusively for U.S. military veteran and active duty students entering the School’s full-time MBA program and was created with a $15 million endowment gift from alumnus Lorenzo Fertitta (MBA ’93) and brother Frank J. Fertitta III. Through the program, students receive scholarship support that reduces their tuition to a flat $30,000 per year. Additionally, the program provides academic and professional support customized for all interested incoming veterans to ease the transition from the military to business school and eventually to the business world. Twenty-five students (including three non-scholars) participated in the program’s uniquely designed summer session that included two courses, career programming, access to corporations and alumni, engagement with veteran alumni mentors and social activities to meet their new classmates. At the end of the summer session, the students participated in LAUNCH, Stern’s week-long MBA orientation for incoming full-time MBA students. The Fertitta Veterans Program enhances Stern’s existing commitment to supporting military students. Stern’s Military Veterans Club provides a tight-knit community of support as well as networking events, workshops and more. Seven percent of Stern’s MBA Class of 2019 are veterans or active duty, the highest number of incoming military students the School has enrolled to its full-time MBA program on record.